For nearly as long as I can remember I have received unsigned letters now and again. Anonymous mail. Sometimes a letter may be a suggestion for a column or for a story. Sometimes a letter will be — well, not flattering. That is a part of this business. An anonymous letter came through the week past which I think needs a reply even though, in fact, it requires this column to take an untypical form. I remember a long-ago friend of my dad for only one thing. The man had a tic in one cheek; there was a twinge every few seconds in either the left cheek or the right cheek. Rather often the man would squeeze his eyes closed tightly. I asked my dad about this. The surprising thing is I waited with my question until the man was gone. I was told the man was a veteran of World War I. He had “shell shock.” I don’t know if there was any more to that conversation. “War veteran, shell shock.” This explains itself. . . .I am saying this to the laughing uncle. I know something about the war in Korea. Very brave soldiers and Marines in Korea sometimes came to experience trauma - cruel mental suffering. That word/ acronym PTSD is (I believe) of recent origin. What it describes is ancient. Crippen shares an account from seventy years before of a Civil War veteran, Old Pete, whose mind was injured by a "cruel and real injury." PTSD denial is distressing stuff, not only as a vets issue, but for the understanding and treatment of mental illness as well. The bipartisan battle to get mental illness covered on an equal footing by insurance companies was a long and winding road. To promote denial about PTSD in vets is more of the same--with the added shamefulness of abetting whose who would nickel and dime those who serve our country. The number of U.S. military personnel diagnosed with post-traumatic stress disorder jumped 47 percent in 2007 according to new statistics -- a change the Pentagon attributed to greater awareness and better record-keeping. The story notes that the stigma still remains, and some speculate that the military is much more eager to diagnose PTSD when traumatic brain injuries may also be in play. We're proud to call veterans from the Korean War to present conflicts our friends; nearly all of our uncles who served in World War II have now passed. We've noticed that their stories aren't all that different, but perhaps we've been blessed not to know many people who think like the anonymous letter writer's uncle. Our understanding has been shaped by far different tales. One vivid memory from our childhood was of Uncle Stan, who returned to the United States a year after WWII because his combat injuries kept him in a European hospital for many months. Our father and Stan were talking in the backyard about the psychological troubles plaguing many soldiers returning from Vietnam. Dad said something about younger soldiers being whiners, and his brother, who taught shop classes in Southern California, unloaded with a story about having to shoot extremely young German soldiers in the waning days of the war. The boys he shot reminded him of his own little brother back home, he said, then he broke down weeping about his experience nearly thirty years before. It was the first time we'd ever seen a grown man cry outside of funerals. And that ended any sort of talk of slackers in our house. 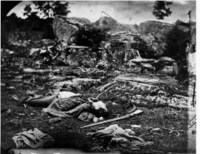 Photo: The dead at Gettysburg.